Just over a century ago in the Mediterranean Sea in between Greece’s Peloponnese and the Isle of Crete, a sponge diver came across an amazing discovery: an ancient shipwreck from classical times, filled with pottery, jewels, wine and so many marble and bronze statutes that, upon surfacing, he “gabbled that he had found a heap of dead, naked women“. The most significant piece from the find, however, was only about the size of a shoebox, and at first seemed to be merely a few unremarkable lumps of corroded bronze. Overshadowed by its flashier fellow castaways, the Antikythera Mechanism drew no serious attention from scholars until many years later. In fact, it wasn’t until 1971 that scientists began to realize the intricate workings, precise measurements and astronomical expertise that the device displayed. So complex, and shrouded in centuries of deterioration, even today, researchers are still uncovering the secrets of this unique artifact. Named after the island closest to where it was found, the device today, a smashed remnant of its former glory, measures only 4 x 6 x 12 inches. Consisting of 30 bronze gear wheels of various sizes in a wooden case, each wheel has anywhere between 15 and 223 hand-cut triangular teeth. The box was crushed at one point (likely during the initial shipwreck), and its parts were strewn across the sea floor. Adding insult to injury, according to scientific historian Derek de Solla Price, “the rest then being coated with a hard calcareous deposit at the same time as the metal corroded away to a thin core with hard metallic salts preserving much of the former shape of the bronze.” Although a couple of gears are visible to the naked eye, with so many destructive forces having their way, it is difficult to discern the mechanism’s true nature just by looking at it. Bit by bit Karakalos and I [Price] were able to analyze the crucial cases where meshing between certain wheels was doubtful. We examined carefully the structure of the differential turntable and of the gearing of the lower back dial and established their connections with little doubt and to such accuracy that for the first time the gear ratios could be associated with well-known astronomical and calendrical parameters. . . . [T]he mechanism can now be identified as a calendrical Sun and Moon computing mechanism which may have been made about 87 B.C. and used for a couple of years. Forty years later in 2006, continued analysis revealed even more complex inner-workings and even more inscriptions. Work published by Tony Freeth and company hypothesized that the device also predicted both solar and lunar eclipses and even portrayed irregularities in the Moon’s orbit. Using high-resolution X-ray tomography, Freeth, et al. also doubled the number of inscriptions that could be read. They determined that the front dial shows the positions of the Moon and the Sun in the Zodiac as well as a 365-day calendar that can be adjusted to reflect leap years. Other dials predict eclipses and some were thought to display less well-known astronomical cycles that reflect elegant mathematical relationships between solar years and lunar months. After considering the newly revealed inscriptions, Freeth’s crew concluded that the mechanism was even older than Price had theorized, and in fact, dated to between 150 and 100 BC. By 2008, continued study revealed that the device also contains a calendar of the Olympic games. In making this determination, the scholars relied heavily on newly discerned inscriptions that reflected the names of the months and were of Greek Corinthian in origin. Because the Romans conquered Corinthian territory in the second century BC (after which Greek would not have been inscribed into a valuable object), the new inscriptions appear to confirm the age of the device to at least 101 BC. Early on, Price believed it had been crafted on the island of Rhodes, well known to archaeologists and historians as a center of astronomical discovery during the first and second centuries BC. The Rhodian Hipparchus (194-120 BC) was an influential astronomer reputed to have discovered the precession of the equinoxes and accurately cataloged the positions of over 1000 stars. Following in his footsteps, Posidonius (135-50 BC) was the “father of tidal studies” who had founded a noted school of astronomy. His student, Geminius, published many of Hipparchus’ and Posidonius’ ideas, including a theory on the cycles of the Sun and the Moon. It was perhaps made by a mechanician associated with the school of Posidonios on the island of Rhodes and may have been wrecked while being shipped to Rome about the time that Cicero was visiting that school ca. 78 B.C. The design of the mechanism seems to be very much in the tradition that began with the design of planetarium devices by Archimedes. These are part of epicyclic gearing that calculates the theory of the irregular motion of the moon, developed by Hipparchos sometime between 146 and 128 BC, the “first anomaly”, caused by its elliptical orbit about the earth. . . . The establishment of the 53-tooth count of these gears is powerful confirmation of our proposed model of Hipparchos’ lunar theory. The invention of Archimedes was admirable . . . . In fact, when Gallus moved this sphere or planetarium, we observed the moon distanced the sun as many degrees by a turn of the wheel in the machine, as she does in so many days in the heavens. Notably, nothing like the Antikythera Mechanism appears in the archaeological record for another 800 to 1000 years after it was submerged in the Mediterranean. Most experts believe the technological know-how had transferred, but that, because these devices were made from valuable bronze, they likely had been melted down at some point over the ages. Similar, if less sophisticated, clockwork devices begin to appear by the sixth century AD in Byzantium, and shortly thereafter, in the Abbasid Caliphate. 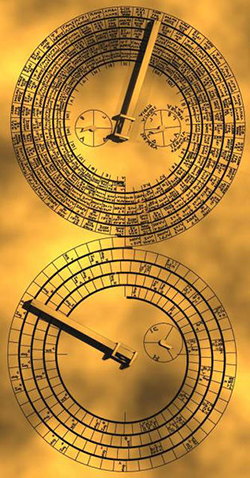 However, it was not until the great Persian astronomer, mathematician and inventor Al-Beruni created his eight-wheeled, gear trained lunisolar calendar computer in 10th century AD that the world saw the Antikythera Mechanism’s like again. I always wonder why people like her don’t have their image on banknotes instead of mere politicians. Do these money-worshippers deserve the most respect ? Or maybe they have done much more for the advancement of the human race than Ada Lovelace and her likes ?